Quality assurance and good laboratory practices are becoming essential knowledge for professionals in all sorts of industries. This includes internal and external audit procedures for compliance with the requirements of good clinical, laboratory and manufacturing practices. 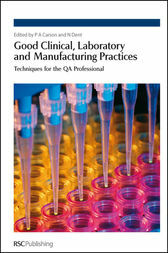 Spanning chemical, cosmetic and manufacturing industries, Good Clinical, Laboratory and Manufacturing Practices: Techniques for the QA professional is aimed at: chemists, clinicians, ecotoxicologists, operation managers, pharmaceutical process managers, quality assurance officers, technicians and toxicologists. In addition sections on harmonisation of quality systems will be of value to safety, health and environment advisors. This comprehensive and high level reference will be an indispensable guide to research laboratories in academia and industry. Additional training material is also included.